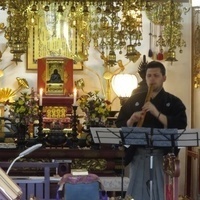 Sponsored by the Warner Concert Series, the Asian and Middle East Studies and a grant from the Omomuki Foundation, internationally performed composer and master shakuhachi performer Shawn Renzo Head continues to transcend borders through his music; mixing Japanese traditional music with a distinct western compositional style. Shawn earned his Shihan degree under the tutelage of Michael Chikuzen Gould and became the youngest non-Japanese Shihan in shakuhachi. He also earned a bachelor's degree in composition from the prestigious conservatory, the Cleveland Institute of Music under Professor Keith Fitch and Professor Steven Kohn. As a performer Shawn has made it his goal to popularize the shakuhachi both in its traditional form and a modern western by commissioning a plethora of composers to write engaging music. Recently he has commissioned composers: Hsin-Jung Tsai, Bo Li, David Vayo, Eric Charnofsky, and more. He aims to commission and perform twenty new works by the year 2020. He has also made it a point to lecture as often as he can at a variety of schools such as: Ball State University, The Ohio State University, the Cleveland Institute of Music, the University of Kansas City Missouri, and Cypress Lone Star College among others. "Shawn Head's performance of shakuhachi music during our recent Classical Revolution Cleveland show was truly stunning. His technical and musical command of the instrument were stunning, and the repertoire performed was captivating. It was the first time CRC has incorporated music from that genre in our shows, and it was eye-opening…. "– Ariel Clayton Karas. As a composer, Shawn has made a substantial output of music that reflects the complex aesthetics of Japanese Music. His recent composition, “Burning Roots Sketch No. 4,” commissioned by violinist, Misha Vayman is an example of the connection between his western roots and with Japanese sounds. Vayman says that Shawn’s music is "A deeply felt Japanese sentiment structured with a virtuosic western filigree." Other performers have said, "When playing Shawn's music, I feel that I need to open my musical perspective to colors, techniques, and tonalities I don't get to use often while playing western repertoire. "-Leah Stevens, flutist. His current project is to render a concerto for Shakuhachi and Orchestra, commissioned by the Energy Corridor Houston Orchestra, (ECHO). Shawn is currently based in Houston, Texas where he actively involved in the Japanese community.